by Wheelock, Frederic M.; Lafleur, Richard A. For nearly sixty years, Wheelock's Latin has remained the opitmus liber of beginning Latin textbooks. When Professor Frederic M. Wheelock's Latin first appeared in 1956, the reviews extolled its thoroughness, organization, and conciseness; one reviewer predicted that the book "might well become the standard text" for introducing students to elementary Latin. Now, nearly six decades later, that prediction has certainly proved accurate. 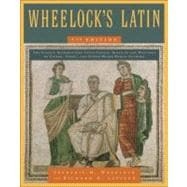 This new edition of Wheelock's Latin has all of the features, many of them improved and expanded, that have made it the bestselling single-volume beginning Latin textbook: 40 chapters with grammatical explanations and readings drawn from the works of Rome's major prose and verse writers; Self-tutorial exercises, each with an answer key, for independent study; An extensive English-Latin/Latin-English vocabulary section; A rich selection of original Latin readings-unlike other Latin textbooks, which contain primarily made-up texts; Etymological aids, maps, and dozens of images illustrating aspects of the classical culture and mythology presented in the chapter readings. Also included are expanded notes on the literary passages, comments on vocabulary, and translation tips; new comprehension and discussion questions; and new authentic classical Latin readings, including Roman graffiti, in every chapter.